WEST COLUMBIA, SC -- The city of Columbia came out a winner as host of the first and second rounds of the men’s NCAA basketball tournament, getting rave reviews even from top seed Duke Coach Mike Krzyzewski. And Brookland-Cayce High School played a small part in it. The Lexington Two school’s new 43,000-square-foot arena was used as a practice site for No. 8 seed Ole Miss and No. 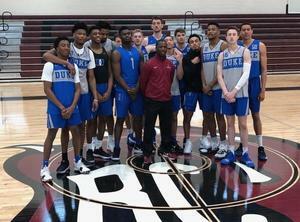 1 seed Duke late last week, in the days before the opening round of games Friday, March 22, at Colonial Life Arena. In the same interview with The State, Duke center Marques Bolden praised the arena, which opened at the beginning of 2019. While Ole Miss lost in Friday's game to Oklahoma, Duke won its first and second round matches and will advance to the Sweet 16. Virginia was the fourth team to play in Columbia. Tournament games were held Friday and Sunday, March 24.